Some Ahmadis who do not understand the details of the religious scriptures try to alter the meanings of this text. However, if one believes in Hazrat Sb he should be ready to face the world for the sake of truth. Hazrat Sb, himself has translated this word and if we believe him to be final authority there is no need to look at any other source. 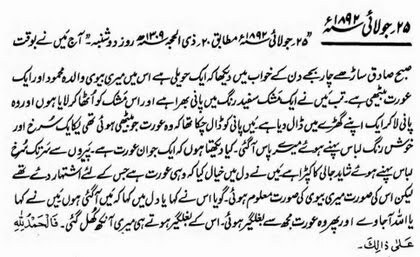 It is important for all Ahmadis to love Hazrat Sb writings and present them to non-Ahmadis for the same. If they are unable to appreciate the message then they should be ready for the name Hazrat Sb has selected for them. It should be remembered that a study of the Holy Quran reveals that by the progeny of the prophets is meant their spiritual progeny. A person who does not believe in the prophets and is un-righteous in his conduct can be told metaphorically that his conduct is not of those legitimately born, meaning, that if he had loved the prophets he would have acted like them and would have been called their spiritual descendant. After this clear explanation, true Ahmadis should not shy away from calling non-Ahmadis bastards or walad-ul-haram. Some stupids of our jamaát ask what is the fault of the mothers of non-Ahmadis as they are being called prostitutes (baghaya). They should know that this fault alone is enough that they gave birth to such people who wanted themselves to be called bastards. It is not us that call them prostitutes, it is the deeds of their children that assign them such a name. ۱۴۔اگست ؁٫۱۸۹۲ ۱۴۔اگست ۱۸۹۲ ؁ ٫مطابق ۲۰ محرم ۱۳۰۹ ؁ھ ۔"آج خواب میں مَیں نے دیکھا کہ محمدی (بیگم) جس کی نسبت پیشگوئی ہے باہر کسی تکیہ میں معہ چند کَس کے بیٹھی ہوئی ہے اور سر اس کا شاید مُنڈا ہؤا ہے اور بدن سے ننگی ہے اور نہایت مکروہ شکل ہے۔ مَیں نے اُس کو تین مرتبہ کہا ہے کہ تیرے سر مُنڈی ہونے کی یہ تعبیر ہے کہ تیرا خاوند مَر جائے گا اور مَیں نے دونوں ہاتھ اس کے سر پر اُتارے ہیں اور پھر خواب میں مَیں نے یہی تعبیر کی ہے۔ اور اسی رات والدہ محمود نے خواب میں دیکھا کہ محمدی (بیگم) سے میرا نکاح ہوگیا ہے اور ایک کاغذ مہر ان کے ہاتھ میں ہے جس پر ہزار روپیہ مَہر لکھا ہے اور شیرینی منگوائی گئی ہے اور پھر میرے پاس وہ خواب میں کھڑی ہے۔"